New shady spot at LadyBird Lake. Today was the first time fishing in almost 2 months, this was due to the high temperatures, in fact today was the 50th day at or over 100 degrees in Austin TX. June was the hostest June on record and July was the hostest month of all months on record. Also I've had a messed up ankle since the middle of June. Ok, well I have been slow getting new articles up on this website, so the last couple of weeks I've been upgrading the website so I can write to it from my iPhone. This allows me to update it real time while I'm fishing. Under mopac on the north west side under the bridge I found a great little shady spot. I got here just before 9am. 1st fish at 11.55pm on the right hand rod fishing at about 60 yards out, 16lb 8oz. Now how do I upload the picture? I have no idea how to insert the pics horizontal I guess I'll fix that when I get home. 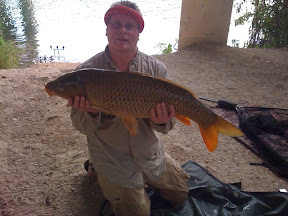 A little while latet I had screamer on the middle rod at about 40 yards it turned out to be a mint condition Common Carp weighing 18lb 7oz about 1pm buy Viagra 100mg online 4px;" />At about 1.10pm the hydroelectric dam opened it's gates and the flow started to take my tackle down stream. 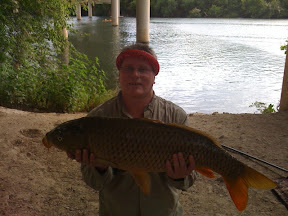 I get a screamer though lost it as the flow had took my tackle around the first bridge strut. The flow was getting stronger and stronger so I put two leads on to hold bottom which worked well for a while, though ultimately the blanket weed was coming downstream with the current and after a while there would be so much of it caught on the line it would cause a huge bow. A few times I would have to reel in up to 3 or 4 lb of this blacket weed. Later on my buddy Matt turned up to see what I was catching, he must have been there 2-3 hours and I got one run though lost it due to the fact the current had taken the line around the bridge strutt and the line was just clogged with weed. 10 minutes after Matt left I got this 21lb 4oz common.